By Daniel Horowitz--When Toronto’s Lawrence Merkur passed away in 2008 at the age of 54, the somewhat reclusive and extremely compassionate man with a penchant for cats left an unknown fortune to Toronto’s Salvation Army, creating an unusual “marriage” of sorts. 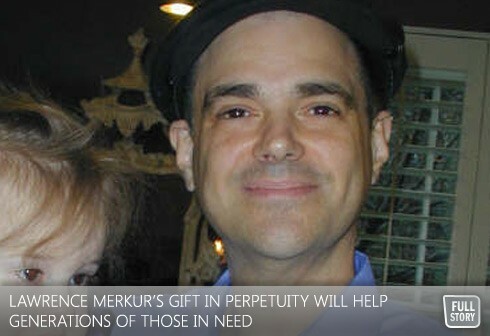 The day after his death, it was discovered that Merkur, - an active and extremely successful trader in the silver market since 1990 - had amassed thousands of ounces of silver, worth between seven and eight million dollars. Needless to say, his death had a silver lining for the Salvation Army and the tens of thousands of men, women and children among Toronto’s hungry and homeless individuals. And, as fate would have it, thanks to Lawrence’s brother Ephry, Beth Tzedec’s Rabbi Baruch Frydman Kohl and UJA Federation of Greater Toronto, our city’s more than 20,000 vulnerable Jewish residents are also receiving the benefits. In his will, Lawrence left his silver to the Salvation Army in trust, for perpetuity, meaning that it will continue to assist our city’s most vulnerable for generations to come. And, typical of Lawrence’s quiet lifestyle, he didn’t want to have his name attached to the gift – the largest single donation made to the Salvation Army in Canada. Instead, he wanted the donation to honour the memory of his late sister and a cousin who also passed away at age 11 in 1966, Sydney Eve Atin. Another challenge confronting the Merkur family was how the Jewish community in need – more than 21,000 Jews in the GTA live at, or below the poverty line - could also benefit from Lawrence’s gift. In 2011 alone, more than 100,000 pounds of kosher food was delivered through the Salvation Army to low-income Jewish families. “Laurie has done so much more than help the needy- he has forged a relationship between interfaith organizations and community members who may have overlooked their common bonds in helping the poor,” says Jordan Atin, Lawrence’s first cousin, and an Estates and Trusts lawyer who took care of Lawrence’s will To do so in the name of two girls, his sister, Carol Merilly and my sister, Sydney Eve Atin, both of who died at very young ages, is a remarkable tribute."